LONDON - Retailer HMV has teamed up with Seatwave, the online fan-to-fan ticket exchange brand, to launch an in-store music ticket box office. 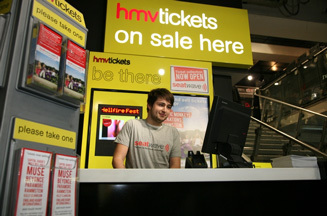 Through the partnership, customers exchange tickets in HMV right up to the day of the event. Seatwave will also launch an online ticket exchange for HMV. The company added that the move would help the company combat ticket delivery issues caused by the postal strike. Seatwave plans to offer an e-delivery service in 2010.